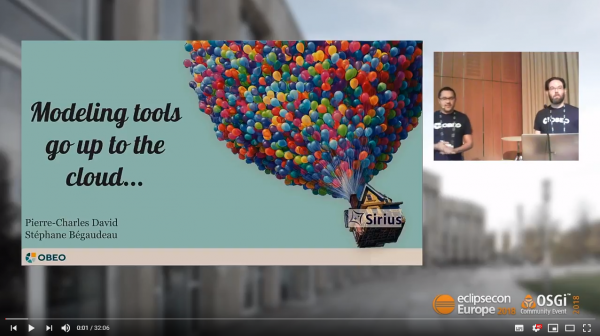 This year, SiriusCon came from a physical event to an online conference, still dedicated to graphical modeling tool and more specially to the powerful technology, Eclipse Sirius. As you know Sirius is a global solution used worldwide and we decided that SiriusCon will follow the wave by going live and online! Each of the first three SiriusCon editions confirmed that the Eclipse Sirius community is enthusiastic about it. During this free event, organized by Obeo with the support of the Eclipse Foundation, attendees benefited from users feedback, advanced features presentations, and demonstrations. Since the 6.0 release, Sirius is embracing the web and the cloud... The team is working hard to enable you to also execute your own modeling workbench in a web browser. Sirius is a global solution used worldwide within today's seamless world! SiriusCon 2018 kept the same spirit between friendship and exclusive content from the Sirius expert team. But this year, during two half-days (to overcome the inevitable time difference constraint), attendees enjoyed SiriusCon directly from their laptop. No need to travel, no need to negotiate a whole no work-day with your manager, attendees just sat down and enjoyed! Want to relive SiriusCon 2018 key moments? Enjoy the slides and recordings!